Cupcakefaerie and I recently took a basic photography class to learn more about digital SLR cameras and general settings. It was only 3 weeks and 4 sessions but there was a whole lot of learning going on on my end. And now I want to practice so I don’t forget (because I know how easy that is to do). One of the assignments was to focus on lines shapes and textures. 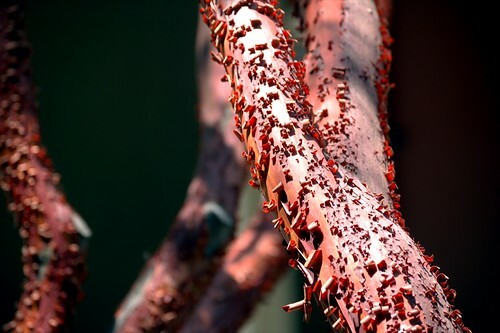 I have always been fascinated by the shedding habits of the manzanita bush. We’ve got quite a lot of it in our dry hills. I love how it sheds in such perfect curls and its underlayer is so perfectly smooth. Great photo! Your photos inspire me to continue working on my photography.